About 20 species; see text. Lilac is the common name for any of the various deciduous shrubs or small trees comprising the genus Syringa of the olive family (Oleaceae), which are widely cultivated for their flowers and fragrance. 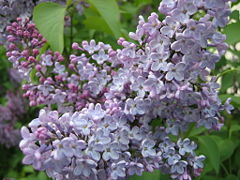 While the color lilac refers to a pale shade of violet or light purple, and the common lilac (Syringa vulgaris) and other species in nature vary from a lilac color to a pink to white in color, numerous hybrids with variations in color have been developed, including deep purple, light purple, blue, pink, red, and yellow. There are about 20 to 25 species belonging to this genus, with the plants native to Europe and Asia (GRIN; FOC; RBGE; FOP). Although the close-grained, hard wood of lilac plants have traditionally been used used for musical instruments, knife handles, and so forth, lilacs are mainly renowned for their beautiful and fragrant flowers and their ease of cultivation. 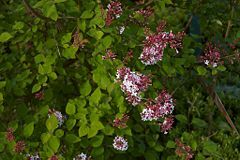 Human creativity has taken the basic species and created new cultivars for ornamental purposes, making the lilac among the most well-known and beloved plants. The unrelated plant "mock orange" (or mock-orange, genus Philadelphus) is also commonly known as syringa and the unrelated but somewhat similar-looking chinaberry (Melia azedarach) is sometimes called "lilac." The plant family to which lilacs belong, Oleaceae, or the olive family, contains around 24 extant genera and around 600 species of mesophytic shrubs, trees, and occasionally vines. As shrubs, members of this family may be twine climbers, or scramblers. The family is characterized by opposite leaves that may be simple or compound (either pinnate or ternate), without stipule. Alternate or whorled arrangements are rarely observed. The lamina are pinnately-veined and can be serrate, dentate, or entire at margin. The leaves may be either deciduous or evergreen, with evergreen species predominating in warm temperate and tropical regions, and deciduous species predominating in colder regions. The flowers of Oleaceae species are most often bisexual and actinomorphic, occurring in panicles, racemes, or panicles, and often fragrant. The calyx, which may or may not be present, and the corolla are synsepalous and four-lobed. The androecium has two stamens inserted in the perigynous zone and alternate with the lobes. The stigmas are two-lobed. The gynoecium consists of a compound pistil with two carpels. The ovary is superior with two locules, each of which bearing two axillary ovules. Sometimes the base of the ovary is circled by a nectary disk. The plants are most often hermaphrodite but sometimes polygamomonoecious. 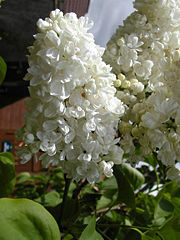 Lilac is the common name for any of the plants in the Syringa genus. The genus is considered to be most closely related to Ligustrum (privet), classified with it in Oleaceae tribus Oleeae subtribus Ligustrinae (Wallander 2007; Wallander and Albert 2000). Lilacs are deciduous shrubs or small trees, ranging in size from two to ten meters in height, with stems up to twenty to thirty centimeters in diameter. The leaves are opposite (occasionally in whorls of three) in arrangement, and their shape is simple and heart-shaped to broad lanceolate in most species, but pinnate in a few species (e.g. S. protolaciniata, S. pinnatifolia). The flowers are produced in spring, each flower being five to ten millimeters in diameter with a four-lobed corolla. The corolla tube is narrow, five to twenty millimeters in length. The flowers are bisexual, with fertile stamens and stigma in each flower. The usual flower color is a shade of purple (often a light purple or lilac), but white and pale pink are also found naturally. The flowers grow in large panicles, and in several species have a strong fragrance. Flowering varies between mid spring to early summer, depending on the species. The fruit is a dry, brown capsule, splitting in two at maturity to release the two winged seeds (FOC; FOP; GRIN; Huxley 1992). The genus name Syringa is derived from syrinx, meaning a hollow tube or pipe, and refers to the broad pith in the shoots in some species, easily hollowed out to make reed pipes and flutes in early history (Huxley 1992; Vedel and Lange 1960). 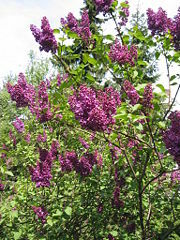 Lilac plants are sometimes called pipe trees. A pale purple color is generally known as lilac after the flower. Sources: (GRIN; FOC; FOP; RBGE). Lilacs are popular shrubs in parks and gardens throughout the temperate zone. In addition to the species listed above, several hybrids and numerous cultivars have been developed. The term French lilac is often used to refer to modern double-flowered cultivars, thanks to the work of prolific breeder Victor Lemoine. Lilacs flower on old wood, and produce more flowers if unpruned. If pruned, the plant responds by producing fast-growing young vegetative growth with no flowers, oriented toward restoring the removed branches rather than flowering. A pruned lilac often produces few or no flowers for one to five or more years, before the new growth matures sufficiently to start flowering. Unpruned lilacs flower reliably every year. Despite this, a common fallacy holds that lilacs should be pruned regularly. If pruning is required, it should be done right after flowering is finished, before next year's flower buds are formed. Lilacs generally grow better in slightly alkaline soil. Lilac bushes can be prone to powdery mildew disease, which is caused by poor air circulation. The wood of lilac is close-grained, diffuse-porous, extremely hard, and one of the densest in Europe. The sapwood is typically cream-colored and the heartwood has various shades of brown and purple. Lilac wood has traditionally been used for engraving, musical instruments, knife handles, and so forth. When drying, the wood has a tendency to be encurved as a twisted material, and to split into narrow sticks. The wood of common lilac, Syringa vulgaris, is even harder than, for example, that of Syringa josikaea. Purple lilacs have been used to symbolize first love, while white lilacs have been used to symbolize youthful innocence. In Greece, Lebanon, and Cyprus, the lilac is strongly associated with Eastertime because it flowers around that time; it is consequently called paschalia. Numerous locations around North America hold yearly Lilac Festivals, the longest-running of which is the one in Rochester, New York. Rochester's Lilac Festival held at Highland Park has the most varieties of lilacs at any single place and many of the lilacs were developed in Rochester. Flora of China (FOC). n.d. Syringa Flora of China Vol. 15: 280. Retrieved June 7, 2008. Flora of Pakistan (FOP). n.d. Syringa Flora of Pakistan. Retrieved June 7, 2008. Germplasm Resources Information Network (GRIN). n.d. GRIN Species Records of Syringa United States Department of Agriculture, Agricultural Research Service. Retrieved June 7, 2008. Royal Botanic Garden Edinburgh (RBGE). n.d. Syringa Flora Europaea. Retrieved June 7, 2008. Vedel, H., and J. Lange. 1960. Trees and Bushes in Wood and Hedgerow. London: Metheun & Co.
Wallander, E. 2007. New classification of the Oleaceae family (Wallander and Albert 2000) Oxford Plant Systematics. Retrieved June 7, 2008. Wallander, E., and V. A. Albert. 2000. Phylogeny and classification of Oleaceae based on rps16 and trnL-F sequence data American Journal of Botany 87(12): 1827-1841. This page was last modified on 25 June 2008, at 00:34.